The Alex Film Society presented Jaws on the big screen at the Alex Theatre in Glendale last night. The screening was preceded by an interview with the film's screenwriter, Carl Gottlieb. Just as its crucial summer tourist season is about to begin, the small beach community of Amity Island becomes the happy hunting ground for a terrifying and ruthless predator: a great white shark with a voracious appetite. Recently appointed Police Chief Martin Brody (Scheider) wants to shut down the island's dangerous beaches after a pair of shark attacks in Amity's waters, but with the lucrative Fourth of July weekend approaching he's thwarted by Mayor Larry Vaughn (Hamilton) and locals more concerned with business than safety. But when a third attack plays out in front of Amity's holiday crowd, summer is over and the hunt for the great white shark is on. Along with young shark expert Matt Hooper (Dreyfuss) and Quint (Shaw), a local shark hunter, Brody heads out to sea to find and battle the beast. 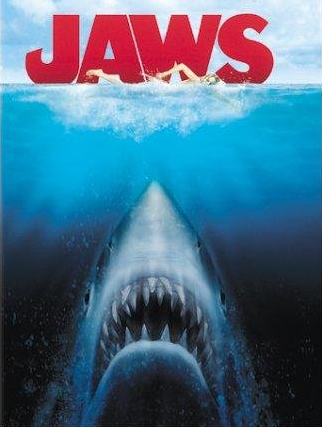 Jaws was a phenomenon upon its release, becoming the highest grossing film of all time until Star Wars took the title. It was the first film to hit the $100 million dollar mark and was also the first summer blockbuster, changing the way studios market and release event films. It also spawned shark fever - beach-goers were afraid to go in the water, there were suddenly numerous shark sightings and interest in shark hunting soared. The opening sequence of the attack on the first victim took three days to shoot. For years rumors abounded that the actress, Susan Backlinie, suffered broken ribs in the process, but in interviews she has denied being injured during shooting. Peter Benchley, author of the bestselling novel the film was based on, was the grandson of famed humorist/writer/ actor Robert Benchley of the Algonquin Round Table. Benchley did his best to adapt Jaws for the screen but was unable to come up with a satisfactory script, so Spielberg brought in actor/writer Carl Gottlieb. In addition to his writing duties Gottlieb also played the editor of Amity's local paper. Apparently there were no hard feelings on Benchley's part - he makes a cameo appearance in the film as a news reporter on the beach. Benchley did reportedly loathe the movie's spectacular (and technically impossible) destruction of the shark, which wasn't in his book. In the years following the hysteria triggered by Jaws, Benchley became a vocal defender of sharks. He stated that he wouldn't have written Jaws if he'd known at the time the negative impact it would have on the species. The classic line, "You're gonna need a bigger boat" was improvised on set by Scheider. When he said it, the Alex audience burst into applause. Quint's boat is named Orca, another name for the killer whale, whose natural prey includes sharks. Lorraine Gary, who played Brody's wife Ellen, was (and still is) married to Sid Sheinberg, who was then head of Universal Pictures. This prompted talk of nepotism, although Spielberg reportedly cast her based on a performance she gave on the television series Kojak. Alternate casting considerations by Spielberg and Universal included: Robert Duvall and Charlton Heston for Chief Brody, Lee Marvin and Sterling Hayden for Quint, Victoria Principal for Ellen Brody, Jeff Bridges, Jon Voight, Jan-Michael Vincent and Timothy Bottoms for Hooper. Benchley's choices had been Robert Redford, Paul Newman and Steve McQueen. The famous mechanical shark was dubbed "Bruce" in honor of Spielberg's lawyer. Bruce (actually three Bruces created for different camera angles) frequently malfunctioned, leading to the necessity of shooting around him, which inadvertently helped the film's suspense because he couldn't be shown. Before the screening, Gottlieb stated that he and Spielberg decided to use The Thing as a template for amping up tension by not showing the monster until well into the story, although they didn't really have a choice. Due to problems with Bruce, weather, and the difficulty of shooting on the sea, Jaws went significantly over budget and schedule. The brutal ordeal has been documented in a "Making of" extra on the 30th Anniversary DVD, an episode of E! True Hollywood Story and in Gottlieb's book The Jaws Log.